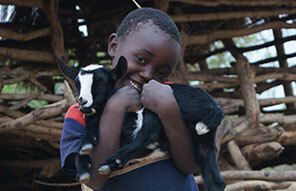 Our Good Goat scheme supplies orphan families with herds of goats – and they really are the gift that keeps on giving. The milk helps provide a sustainable income for the household and is a valuable source of nutrition. And the best part? When the goats reproduce, their kids are passed on to the other orphan families in the area which means that a small amount of funding has an ongoing impact to the whole community. We also fund training and ongoing support in animal husbandry – including how to build kraals to house the goats safely. The project was initially launched in 2014 via Crowdfunder with scores of generous Brighter Futures Zambia “goat herders” pledging their support. Since then, nearly fifty households have received herds of goats – but many more could still benefit from this project with your help.